SpaceX's first Falcon Heavy rocket launches from Pad 39A of NASA's Kennedy Space Center on Feb. 6, 2018. It was the debut flight for the heavy-lift rocket. 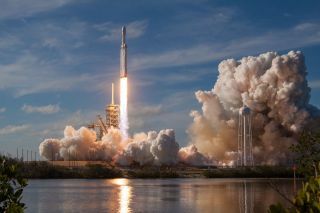 Spaceflight Now reported Friday (March 2) that SpaceX's next Falcon Heavy rocket will launch the Space Test Program- 2 mission for the U.S. Air Force. The mission includes 25 different satellites and spacecraft, the most ever for a SpaceX rocket. Spaceflight Now cited an unnamed spokesperson for the U.S. Air Force Space and Missile Systems Center as its source for the news. SpaceX's second Falcon Heavy mission will come about four months after the Hawthorne-based company's successful Falcon Heavy test launch on Feb. 6. That mission launched SpaceX CEO Elon Musk's Tesla Roadster into space with Starman, a mannequin in a spacesuit, at the wheel. The Prox-1 satellite built by students at George Institute of Technology, and other small satellites built by the U.S. Air Force Academy, U.S. Naval Research Laboratory, University of Texas at Austin, Michigan Institute of Technology, and the California Polytechnic Institute. For more details on the particulars of the second Falcon Heavy launch, check out Spaceflight Now's full report here. SpaceX plans to launch a third Falcon Heavy mission in 2018. That rocket, slated to launch at the end of the year, will carry the Arabsat-6A communications satellite for communications provider Arabsat. In late February, spacecraft manufacturer Lockheed Martin announced that it had completed assembly of Arabsat-6A for the upcoming mission.